As a pitmaster, I’m always looking for fun and creative ways to barbecue Holiday foods in a non-traditional way. Since Easter is coming up later in April, I’ve partnered with my friends at Snake River Farms to prepare a special Easter treat in my pit. I know you’re probably thinking that Harry’s going to cook a ham in his Weber Smokey Mountain. 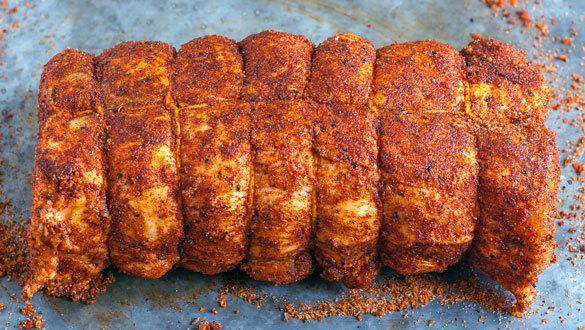 Well, for this Easter, I’m going to smoke one of my favorite cuts from the hog which is the loin. My twist is that I’ve molded it into a spiral log that resembles an Easter ham.For those who want to dabble with curing their own ham, here’s an alternative recipe for a Barbecued Pineapple “Ham”. Who says you can’t have fun in your pit! Snake River Farms Kurobuta pork and ham products have a reputation of being equivalent in stature to “Kobe Beef.” Their pigs are 100% purebred Berkshire hogs per the guidelines set by the Japanese Ministry of Agriculture. I’ve heard that careful husbandry (management and care of farm animals) ala “Happy Cows” is used for their meat production as their hogs originate from SRF-affiliated family farms that can produce their Berkshires to exacting standards such as using no hormones and a slow feed process. I love the flavorful taste of their pork and how the meat color looks darker and more delicious after cooking. 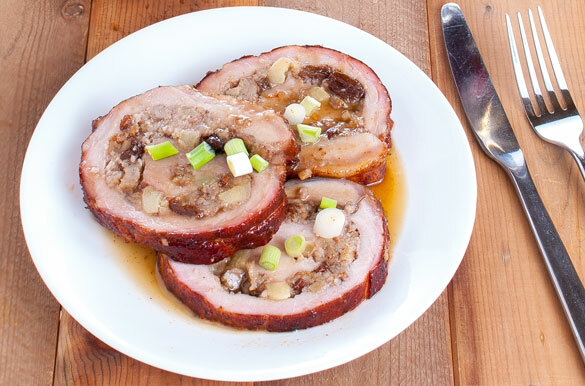 For special occasions I don’t mind splurging on their Berkshire pork to tantalize my guests. 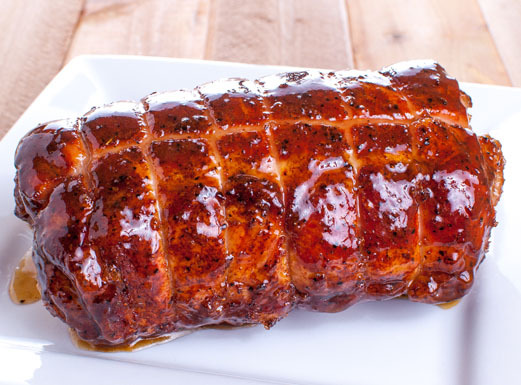 I know that ham is great for Easter but I think you’ll find my Barbecue Spiral Loin to be as good, if not better, as an Easter main dish to surprise your guests. When you start with such a great ingredient, how does a pork aficionado like me take it up a notch? In my airline pilot days, one of the most memorable pork experiences — where the music plays and the halo of light comes from above — was when I bit into a superb pork bratwurst in Frankfurt during a layover in Germany. 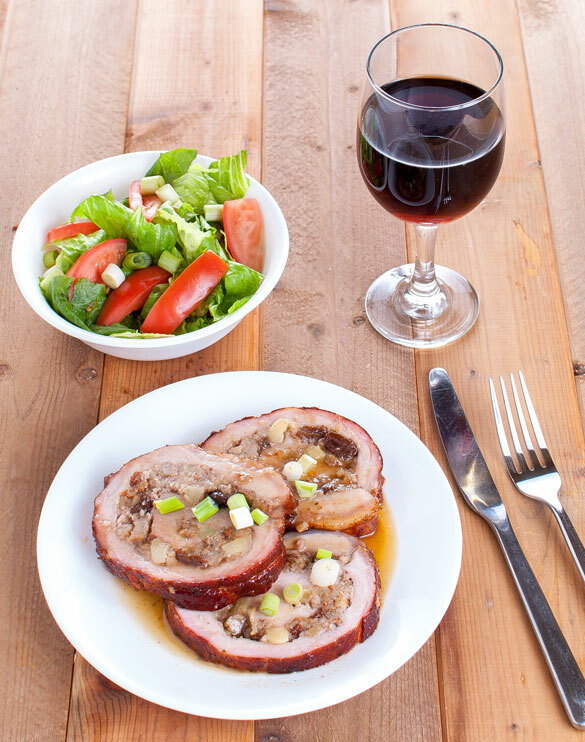 Why not combine that experience with some Kurobuta pork loin? 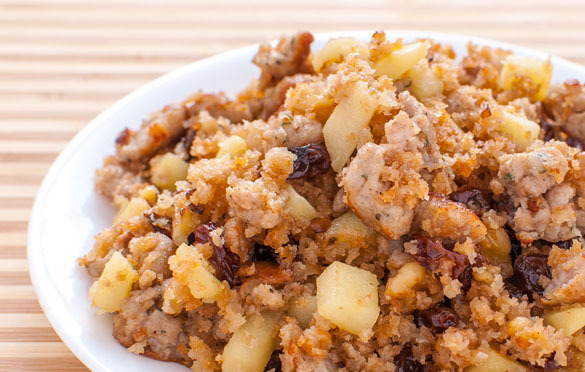 Add some tart crisp apples, raisins for contrasting sweetness, and crunchy walnuts and you’ve created a winning idea! Remove the casings from the fresh (raw) bratwurst sausage and discard casing. Sauté the bratwurst sausage in a bit of vegetable oil over medium-high heat. Remove the sausage once it’s browned and reserve the oil in the pan. Add in the diced apple, raisins and chopped walnuts into the same pan and sauté a couple of minutes. Add the butter and cook until apples are softened. Re-add the sausage and Panko crumbs. Stir for about 30 seconds. 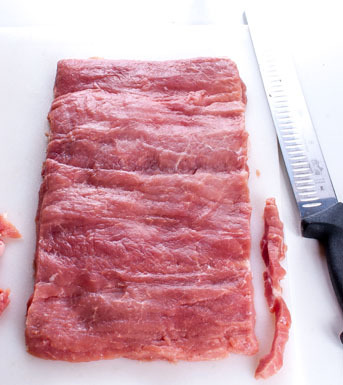 Refrigerate for an hour before proceeding to the next step — it needs to be cooled for food safety reasons if you don’t want to cook the spiral loin immediately. Fillet/butterfly your pork loin so you end up with a flat piece. Trim off excess ridges and thicknesses. Cover with plastic wrap and pound flat a bit with the smooth side of a mallet. Trim the sides squaring them up. Apply some SYD rub or salt and pepper. Lay the refrigerated bratwurst stuffing down leaving 1 inch borders. Roll and tie into a spiral log — making sure to roll up the non-fat cap end first, so that the fat cap is on the outside of the roll. Apply some SYD rub on the outside and wrap in Saran wrap. Store in fridge until ready to cook. Start your pit and when pit temp is stable at 250F, transfer the cold spiral loin from the fridge into your hot pit (this will help generate a smoke ring). Cook until the pork internal temperature is 145F (Note: add 1 tennis sized chunk of apple if you’re using Kingsford briquettes as I did). 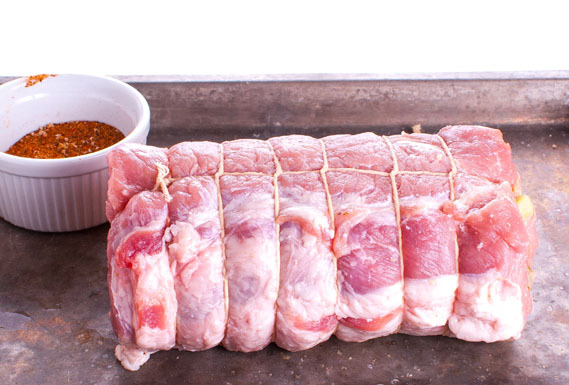 Remove from pit and loosely tent with foil for 15 minutes to allow it to cool and for juices to re-distribute. While pork is cooling, prepare the glaze. Saute the butter & brown sugar in a pan. 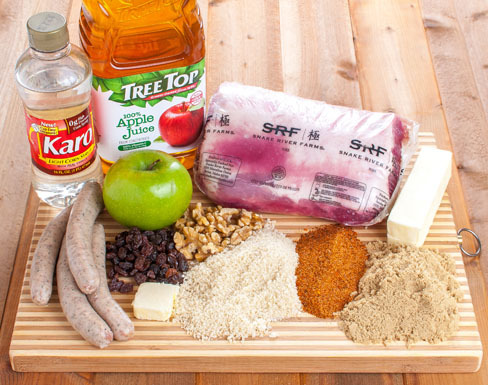 Add Karo syrup, add apple juice and simmer to reduce the mixture to the consistency of thin gravy. The pic of the loin glazed (glazed loins…MMMmmMmm)drove me over the edge. I’m making it tonight. Thanks! Are you talking about adding an Apple to the charcoal for smoke flavor? Thank you Harry for taking the time to post the holiday recipes. I made 3 of these for our family’s Easter dinner. I will post pics on the alumni fb page. Thanks again, and please keep them coming. Great recipe and easy to follow instructions. Made this for my family and they loved it. Making it again this weekend. Thank you! This recipe looks fantastic! I am trying to picture how you are butterflying the pork loin. 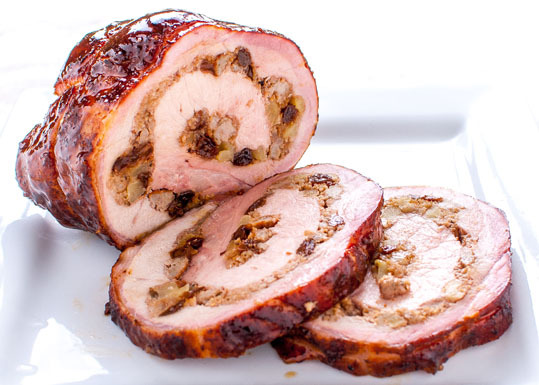 That cut is plentiful around here, and I have seen some stores offer a stuffed pork loin, and have wondered how they made the roll out of it. 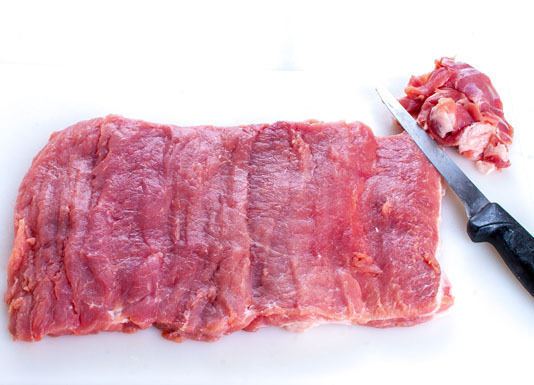 With the pork loin being somewhat flat in shape, are you cutting into the side, down the length of the pork loin? I’ve had this is my recipe book for about a year now and decided to make it over Christmas eve for a small gathering. I used a standard raspberry chipotle sauce as the glaze (in lieu of the Karo) and Italian sausage. Other than that followed to the letter and it came out fantastic. The sweet and savory went really well with the pork. Done a lot of roll ups and fatties but this one really shines above the rest. Thanks Harry !! !